West Ham continuous to struggle with injury problems once again. Diafra Sakho remains out for six weeks. Gökhan Töre and Sam Byram are also out. Andy Carroll has returned to training but is not match fit yet. Aaron Cresswell and Michail Antonio are doubtful for this clash. Cheikhou Kouyate could be back in his favourite midfield role. Lucas Perez started the game against Southampton in the League Cup earlier this week, but is expected to take the bench for the West Ham game. Midfielder Mohamed Elneny is doubtful through illness. Hector Bellerin, Mathieu Debuchy, Santi Cazorla and Per Mertesacker are all out for this game. Cazorla will be undergoing a surgery later this week. Danny Welbeck has returned but is not ready for first team action. Arsenal have won four of their last six Premier League games against West Ham. Arsenal are unbeaten in their last 12 Premier League games. West Ham have won only one of their last 17 games against the Gunners in all campaigns. West Ham have not won any of their last four league games. 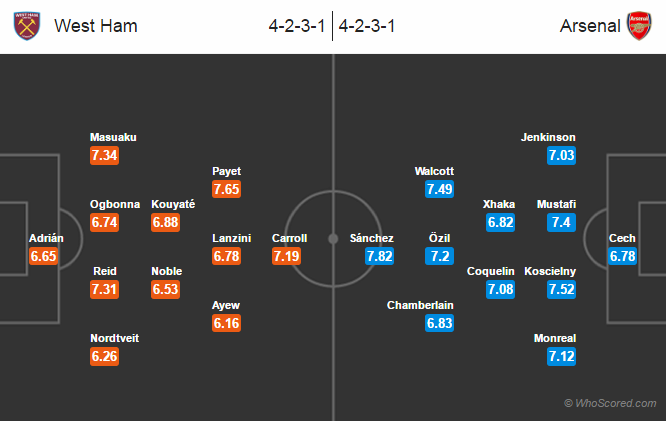 West Ham 1 – 1 Arsenal, a tough game for the visitors. Alexis Sanchez is expected to shine once again for the Gunners.